Amir H. Abolfath of The World at Night took this photo of the Milky Way over Alamut Valley in the Alborz Mountains of Iran in August 2010. 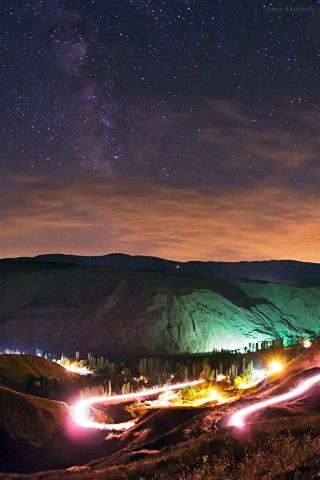 The serene Milky Way galaxy towers over Alamut Valley in Iran in this spectacular night sky photo. Amir H. Abolfath of The World at Night took this stunning photo from the Alborz Mountains of Iran in August 2010. Scientists estimate the Milky Way galaxy contains roughly 400 billion stars bound together by gravity. Above the glow of the mountains, the barred spiral galaxy appears as a faint band in the sky. In the image, car headlights can be seen on a winding road in the valley. Lights from nearby cities also reflect within southern horizon clouds. Editor's note: If you have an amazing night sky photo you'd like to share for a possible story or image gallery, send photos, comments and your name and location to managing editor Tariq Malik at spacephotos@space.com.